Discover the wonders of Iceland and the Northern Lights. Fly to the Land of Fire and Ice to explore Reykjavik – one of Europe’s most surprising, welcoming and happening cities. You’ll also have the chance to witness the captivating ‘flames’ of the Aurora Borealis, and to discover the smouldering volcanoes, geysers, glaciers and bubbling thermal pools of the startling Icelandic landscape, on this unforgettable break. Fly to Iceland’s Keflavik Airport, meet your Tour Manager and transfer into the capital to your chosen hotel. For the rest of the day you’re free to relax and explore. This morning’s included, guided city tour will introduce Reykjavik and its surroundings. Take in city views from extraordinary landmarks such as the Presidential Residence and the towering Hallgrim’s Church. In the afternoon, explore Reykjavik under your own steam, or join an optional excursion to the world-famous, mineral-laden Blue Lagoon outdoor spa. No visit to Iceland is complete without a dip in these bubbling geothermal pools, set in the strange lunar-like landscape of a volcanic lava field. Discover Iceland’s natural treasures on today’s hugely popular, optional Golden Circle tour. See the extraordinary Thingvellir lava arena that once hosted the island’s national parliament, and the misty torrents of the Gulfoss waterfall. Visit the original Geysir (now all but extinct) and its more active neighbour, the Strokkur waterspout, before returning to Reykjavik. 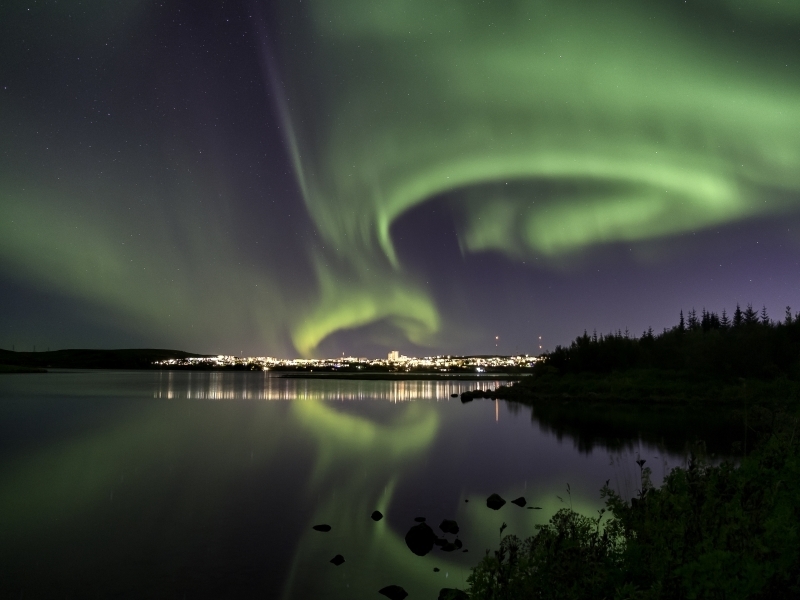 This evening, enjoy the highlight of your tour – an included trip out of the city in search of the Northern Lights, the enchanting Aurora Borealis, that flicker across Iceland’s winter skies. Should you be lucky enough to view them, they are an unforgettable sight. Transfer back to the airport for the return flight to the UK, at the end of a wonderful few days.